Library workers, this is your chance to be heard! CUPE has launched Phase 2 of the National Survey of Precarious Employment in the Library Sector, and we are inviting library workers to participate in the online survey. During Phase 1, we surveyed CUPE library workers who work in stand-alone public libraries, defined as a public library that is its own CUPE local, is not part of another local, and has its own collective agreement. We want to thank all those who participated in Phase 1.
or other (i.e. special library). 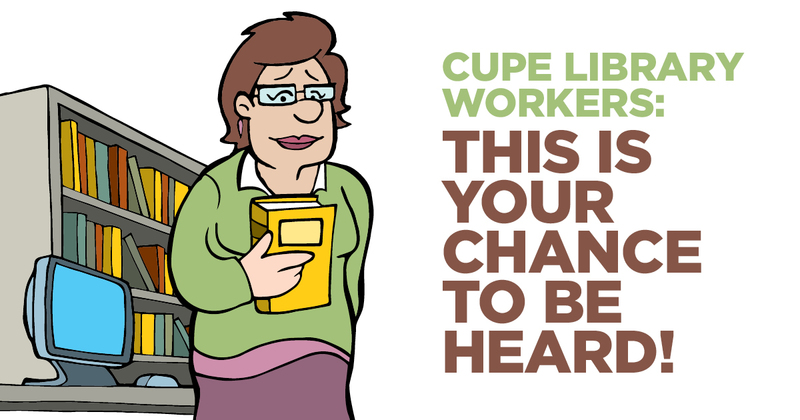 Encourage CUPE library workers in your local to participate in the survey and share the online link. A printable flyer for your members is available here. The quality of the information we gather depends on the number of surveys that are completed. Please note, the survey expiry date has been extended to December 31st, 2017. CUPE’s 2014 membership survey revealed that permanent, part-time employment is highest among public library board workers, at 46 per cent. We also learned that 70 per cent of library clerks work part-time hours. The results prompted delegates to the 2015 CUPE National Convention to adopt a resolution to conduct a survey on precarious employment with CUPE library workers across the country. Responses to the survey are anonymous and confidential. See attached letter from CUPE’s national officers.